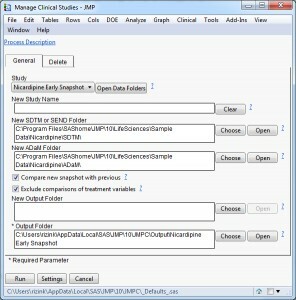 JMP Clinical 4.1 contains example data to help illustrate its new review functionality. This additional data is referred to as Nicardipine Early Snapshot, and includes Nicardipine data only through 01 Aug 1989. There are numerous changes to this data set: 11 subjects have yet to enroll in the trial, the values of several variables for current subjects are different, the treatment has yet to be unmasked, and the ADSL data set is not yet available. 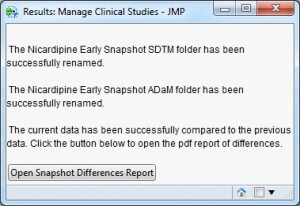 This “study” will not come pre-loaded in the JMP Clinical dropdown menu, but adding and updating the study as we perform here shows how straightforward the process is. To add this early snapshot of Nicardipine to JMP Clinical, click the Settings button within the Add Study Local dialog window (Figure 1). 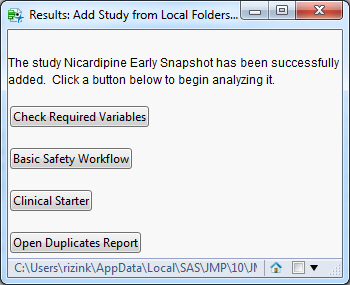 From Example Settings, choose NicardipineEarlySnapshot and run the Add Study Local Analytical Process (AP). 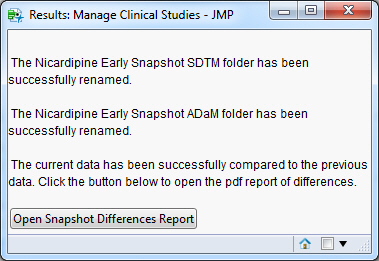 Once JMP Clinical has collected the appropriate metadata, the study will be added to the dropdown menu. Users are free to check if they have the needed variables to perform various analyses, run the Basic Safety Workflow or check for record duplication using Open Duplicates Report based on our discussion from last time (Figure 2). You’ll notice that this report describes the keys used for each data set and whether any duplications are present based on the keys. 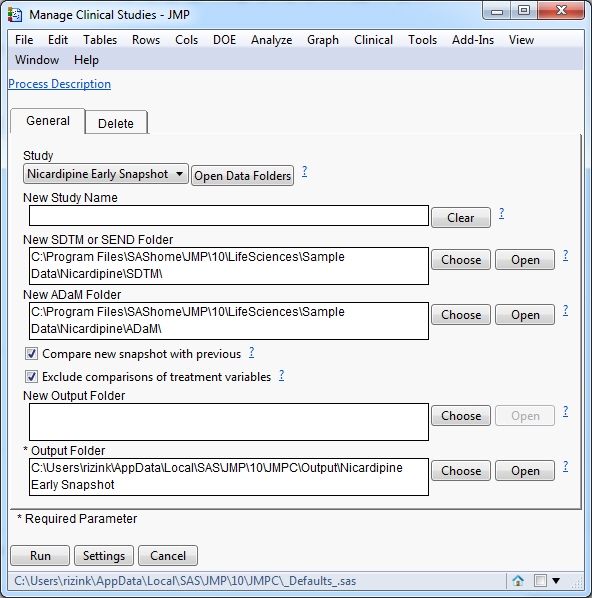 Remove the study from JMP Clinical. Update the keys for problematic data sets. Re-add the study and review the duplicate report. Of course, if this is the locked version of the database with no further updates planned, duplicates may be less of a concern since data will not be further refreshed. The ability to save notes at the record level will still be possible in order to track comments for the final study report. We can perform any number of analyses or add notes to records or subjects for the Nicardipine Early Snapshot study. To update the study to the complete Nicardipine data snapshot, go to the Manage Studies AP. Select the NicardipineEarlySnapshot example in a similar manner as above (Figure 3). Notice that the data directories are identical to the Nicardipine example. The option Compare new snapshot with previous performs comparisons between the two sets of data. Exclude comparisons of treatment variables will prevent any differences or notes based on unblinded treatment codes from entering the differences report or notes database. 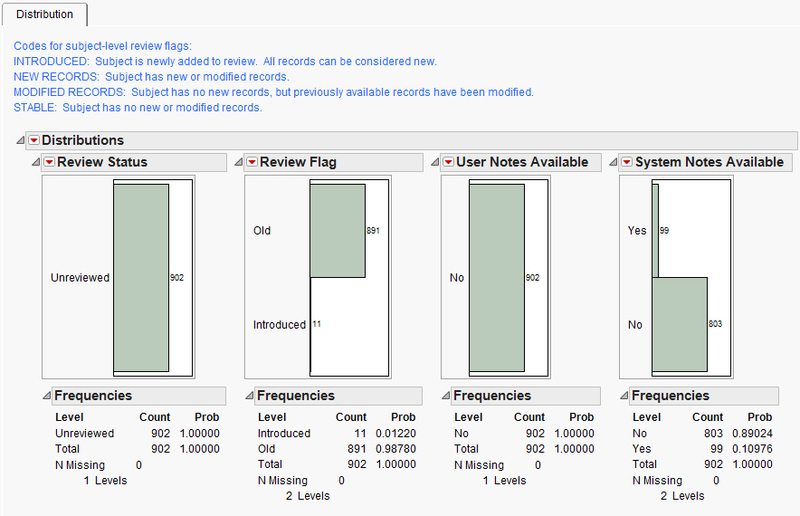 Once comparisons are performed, the user can select Open Snapshot Differences Report (Figure 4) to view changes to any variables from previously available records, duplications or records dropped from the current snapshot. 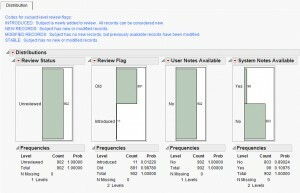 As a useful first step, the Review Status Distribution AP can be used to identify subjects that are newly available or with a modification to their data, subjects that have user- or system-defined notes available, or those that have been reviewed from the patient profiler (Figure 5). Filters for new or modified subjects can be created here so that analyses can be easily subset to the subjects of interest. Of course, notes can be added or reviewed at any time, and analyses can be easily subset to new records (described in this post).